Welcome to this year's first issue of SCUBA News. I hope you enjoy it. Any questions, comments or articles for publication - contact news@scubatravel.co.uk. I look forward to hearing from you. World class diving at the Cocos Islands where sailfish, marlin and hammerhead sharks congregate - but also some good diving on the Pacific side of the Costa Rica mainland. Botswana - that land-locked country. Not a place that readily springs to mind for a diving holiday. But you can now dive with Nile Crocodiles in the Okavango Delta. 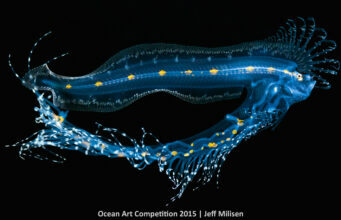 An extraordinary blackwater photo of an eel larva - which has been photographed only a handful of times before - has won the 2015 Ocean Art Underwater Photo contest. 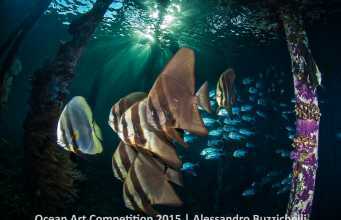 Organised by the Underwater Photography Guide, the competition saw over $70,000 of prizes awarded to 75 underwater photographers. Photographers could enter any of fifteen categories, including novice and compact camera. 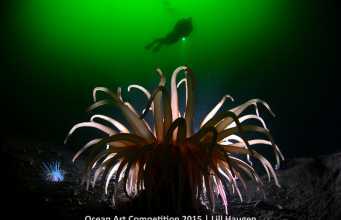 Lill Haugen won the cold water category for the second year in a row with her shot of a backlit anemone taken in Norway. Thousands of entries were viewed by the judges before the final set of images were selected. Taken on Tulamben, Bali by So Yat Wai. The purple background is a tunicate. Another repeat winner is Steven Kovacs, whose photos have won or been placed in every one of the 5 Ocean Art photo contests there have so far been. 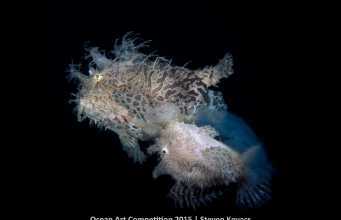 This year he achieved first position in the Marine Life Behavior category for his photo of Striated frogfish releasing and fertilising eggs. When a female Striated frogfish is ready to spawn she rises towards the surface closely followed by the male. As she releases her egg mass the male fertilizes them. Underwater Photography Guide publisher, Scott Gietler said, "The caliber of photos in Ocean Art this year was amazing, and the judges had to make some very difficult decisions when evaluating photos in the contest. 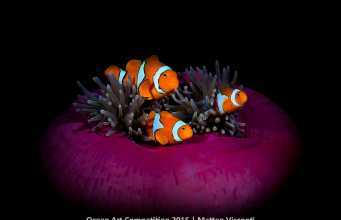 The winning photos were submitted from oceans and freshwater around the world by many talented underwater photographers." 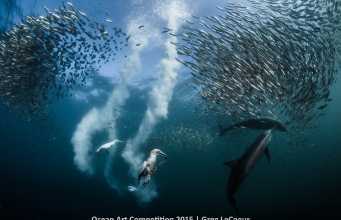 Sardine Run – taken in Port St Johns, South Africa. 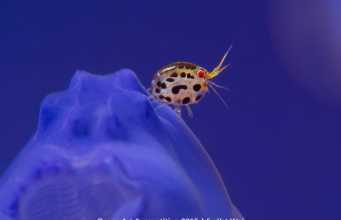 You can see more of the winning photos on the SCUBA News site. I'm looking to dive the NE coast (of Cuba) in my own boat. Any recommendations? Contact news@scubatravel.co.uk with your suggestions. 30% of global fish catch may be unreported; 60% of shark catch. The Welsh Government is considering re-opening Cardigan Bay SAC (Special Area of Conservation) to scallop dredging - dragging hooks and chains across the seabed. They have launched a consultation to find out what people think.